UDM Downloads > Video Edit ActiveX Control! Image To Video. Resize specific video resolution. Export video frames to separate image files and resize to specific size. 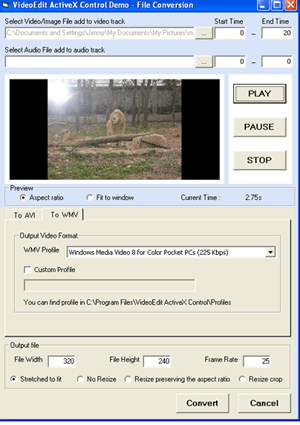 Extract video/audio track from mpg, wmv, avi, mp3, wma files and then save to avi (uncompressed)/(compressed using any available codec), or wmv files. Provide a transition (over 20 transitions) and an effect (over 50 effects) between any combination of video clips, pictures. Unlimited video transition ( use third party video transition). Convert video files from one format to another or wmv files. Join/merge a lot of video/audio files into avi or wmv files , even if these media files are of different file formats. Add a number of image ,sound files and then create avi or wmv files. User define frame rate when save to avi files. Preview Video/Audio file before output to avi or wmv files. Video Compressor Setting (DIVX,WMV 9....). Video Compressor and WMV Profile selection. Supports all major video formats including MPEG1, DivX, XVid, WMV Compatible with any programming language that supports ActiveX (Access, Visual C++ , Visual Basic , Visual Foxpro, Delphi, .Net, etc.) Include Access, Visual C++ , Visual Basic , Visual Foxpro, Delphi, .Net Sample Code. Royalty free distribution of the OCX file.